I had planned to make this a weekly post, but a few people have expressed interest in the topic, so I decided to visit the series more frequently. After all, there is a plethora of small movies that people have either missed or forgotten. 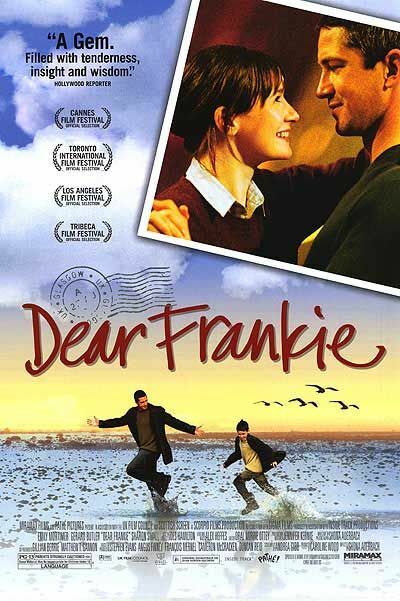 Dear Frankie is set in a Scottish seaport where the main characters, Lizzie (Emily Mortimer) and her son, Frankie (Jack McElhone), have fled to elude her abusive husband. To save Frankie the heartache of his father’s terrible cruelty–one act of which left Frankie completely deaf– Lizzie has told her son that his father works on a sea-going freighter, the Accra, traveling the world and sending letters from exotic places. Every time he gets a letter, Frankie marks the location on a map over his bed, exploring the wonders of the world with his nearly perfect dad. Imagine his excitement when he hears that the Accra is putting into port in their very own town, news that sends his mother into a full blown panic. Her husband was never on the Accra; she is the one who has been writing the letters. She can’t bring herself to destroy her son’s fantasy world, so instead she hatches a plot to maintain the illusion. She hires a man (Gerard Butler) to pretend that he is Frankie’s father for the brief time while the Accra is in port. This man with no name, himself a jaded sailor, is completely won over by the hopeful, trusting young boy and so embraces his role as father with great enthusiasm. Lizzie, at first put off by the man’s familiarity, comes to appreciate the joy he is bringing her son. His gentle and unexpected attention toward her pushes through the barricade she has built around her heart, and they spend a wonderful happy weekend as a family. A shadow passes over their sunny day, however, when the threat of Frankie’s real father blows back in. Lizzie, strengthened by knowing what it is like to have a kind, loving man in their lives, refuses to give in to her barbarous husband. Free at last from her fear, she faces a new, hopeful future. Unfortunately, the stranger has left without ever even telling her his name. Everything about this movie draws you in, from Lizzie’s desperation, to Frankie’s wise yet innocent understanding of the world, to the handsome stranger’s tender affections. It is a wonderful fantasy, and yet so down to earth you will swear you heard the story from someone who was there.